My partner's 12 years older than me and we've been together for years now. For me, age really doesn't factor much into wether I'm attracted to a guy or not. It's super cliche but genuinely it's all about personality for me and wether or not I actually enjoy being with that person. I have always been quite old for my body, though, and people often think I'm older than I actually am. A couple times, me and my partner have been mistaken for the same age so I think that's probably true. I honestly never notice our age gap, though - it's just not really something that bothers me or effects me. To me, as long as you're both of age and it's all consensual, I really don't see a problem with any kind of age gap. I'm doing a double bill of Wheel of Fortune from '97 currently. It was Bradley Walsh's second TV job and he's just so awful. He keeps making really bad jokes, his hair looks terrible, his suit is so garish it's blinding my eyes and his co-host is all leg and no personality. It's so addictive. If I looked as good as Mark did, I don't think I'd ever wear boxers again. I switch between baggy boxers and briefs now-a-days, though - really it all depends on what I fancy when I wake up. I switched back to them when I was 13 and then introduced boxer briefs when I was 16 or so and regular boxers again a couple years back, when I was 18. I'm almost 20 now and I'm slowly going back to them more and more - I probably do 60% boxers/40% briefs now. Loving all the photos guys - that's a good pick-me-up at gone midnight. 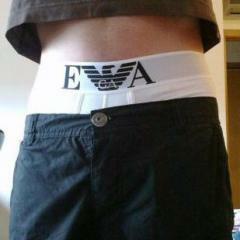 I'm looking a bit chavvy myself currently - white polo shirt, dark grey joggers and some new blue Lonsdale briefs. I've been wearing regular briefs a lot recently, actually, and I've gotten pretty into sagging with them - I'm not showing quite as much as my boxers, granted, but I'm still making sure to show something off. Anyone else been sagging them at all?